As we noted in our discussion of melody & harmony, the rise of tonality was followed by its eventual dissolution, brought about by the ever-increasing ambiguity of tonal centres which, for purposes of extra-musical expression, were eventually excised from musical discourse. The course of the development of temporal structures shows similar traits: moving towards clarity of pulse and metre and then away from it. As in the case of harmony, we find striking examples in the work of Beethoven. In the first movement of his Symphony No. 3 in E flat (Eroica) for example, the feeling of triple time (a first movement in triple time was an innovation in itself) we find several parallels between harmony and rhythm: even in the 8th bar (around five seconds into a work of some fifty minutes‘ duration, depending on the conductor’s interpretation), the ambiguity of harmonic trajectory brought about by the ‘cellos’ C sharp is echoed by syncopation in the violins. Throughout the movement, the sense of metre is frequently disturbed by an emphasis on the second beat of the bar or by emphasis on every other beat, over a period of several bars. This is taken to extremes in the development section, where the sforzando attack on the second beat of the first bar, and subsequently on every other beat, generates a deliberate feeling of duple time in direct conflict with the underlying triple pulse. Those familiar with the work will know that the excerpt below occurs four times, treated sequentially, with the metrical ambiguity being heightened by the downbeat being sounded only once in every six bars. It is also notable that the episode with which this example begins culminates in one of the most daring dissonances to have been used up to that point, and when the harmony resolves into E minor (bar 288), only then does the metre also resolve and take on the clear aspect of simple triple time once more. Later composers such as Chopin, Liszt and of course, Wagner and Debussy, further blurred tonal centres while revealing parallels between harmony and musical time in various ways. As in the case of harmony, the need to give expression to intense emotions, moods or extra-musical ideas was imperative. Some of Chopin’s piano works, as well as certain of those of Brahms and Schumann, contain layers of rhythm that are ostensibly so complex as to be almost unrealisable with any degree of clarity – if indeed, that was such a criterion for performance as it is today: in fact some rhythms, such as the ‘quintuplets’ against semiquavers in the example below, are incorrectly aligned, or simply don’t ‘add up’, leading to questions as to what the composer’s rhythmic intentions actually were. However, even if realised only approximately, they succeed admirably in conveying the sense of drama that was no doubt intended. In the example from the opening of Wagner’s Tristan & Isolde below, we note not only the absence of a clear tonal centre but also the absence of any clearly defined rhythm or metrical foundation; ambiguities which are only intensified by the degree of rubato that the performance of this passage invites. A similar correlation between harmony and metre, with increasing degrees of ambiguity in both, can also be found in the work of Claude Debussy (1862-1918) and in the music of the Second Viennese School: along with the phenomenon that Arnold Schoenberg (1874-1951) termed the emancipation of the dissonance, came a similar emancipation from the tyranny of the bar line. As is well known, Stravinsky’s ballet culminates with the sacrificial dance in which the chosen maiden is compelled to dance until death. The accompanying music is brutal and convulsive in its effect, due to irregular metrical patterns, coupled to stringent, percussive harmony, this time more discernible as harmony owing to explosive chords on forte-fortissimo muted brass instruments in mid-register. In 1913, when ‘Le Sacre‘ was first performed, many might have thought they had indeed glimpsed the music of the future. Nothing quite like it – especially in terms of rhythm and metre – had been heard before. Despite this perception, which was in essence quite superficial in many respects, we can readily observe that the metrical ratios deployed do not venture beyond 2:3. The semiquaver (16th note) groupings in the example above are 3, 2+3, 3, 2+2, 2+3, simple and compound beats having been placed in succession, thus creating beats of unequal length and therefore, irregular metre. Even patterns such as those in example a) below, often encountered in the music of Stravinsky, Bartok and composers such as those who comprised Les Six , are not, as it might at first appear, in the ratio 4: 5, but, in fact, in the ratio 2: 3: the metrical pattern is 2+2+2+3 or possibly, 2+2+3+2. This emphasises the fact that although there is a clear relationship between the development of harmony and of rhythm, and that these developments are closely bound up with the frequency relationships inherent in the naturally occurring harmonic series, rhythmic development did not, for several reasons, ‘keep up’ with intervallic development: even the complexities of Stravinsky (save for the instances of 6:7 ratio in the first tableau of Petrushka) et al ‘boil down’ to juxtapositions of metrical divisions of 2+3 or 3+2; horizontally, to create irregular metres or time signatures such as in the Danse Sacrale, or vertically (2 over 3) to create polyrhythm . Patterns such as b) & c) below, which incorporate the true ratio 4:5, although found in certain folk music, did not become commonplace in western music until the mid-twentieth century . When working with higher ratios of the harmonic series, however, we would find less straightforward rhythms but they too, like all composite rhythms derived from the interplay of frequency ratios of the harmonic series are palindromic. The following example is the result of the interplay of frequencies in the ratio 8: 9, the frequency ratio of the interval of the major 2nd. We see that the pattern of durations (measured in semiquavers or 16th notes) up to the dotted line is reversed thereafter. Those who are curious about the ‘working out’ of this rhythm can click here. Messiaen made extensive use of similar rhythmic patterns and coined the term non-retrogradeable rhythms to identify them. We cannot substantiate any claim, but neither can we categorically refute, that Messiaen’s predisposition towards such structures stemmed from an acute though probably subliminal awareness of the inner working of the harmonic series . Whatever the case may be, the relationship between patterns of the type illustrated and the harmonic series is beyond dispute; it is a physical fact which is mathematically provable. The implications of this will be discussed further in the next article. The influence of Messiaen’s use of rhythms that comprised successions of durations rather than divisions of metrical units, together with the serial approach to the organisation of pitch propounded by the Second Viennese School and Anton Webern in particular, led to the short-lived concept of integral serialism. In this approach, series of durations were manipulated and treated in ways analogous to the series of pitches originally expounded by Schoenberg in postulating his twelve-tone system. By the use of various matrices, composers such as Karlheinz Stockhausen (q.v. ), Pierre Boulez (the two most famous of Messiaen’s pupils) and the Italian, Luciano Berio (1925-2003), mapped series of durations to those of pitches, dynamics, timbres and even articulations. The paradox of such an extreme of order was that the effect was one of disorder or randomness as many of the composers involved (particularly Boulez) have since acknowledged. In terms of musical time, there were no recognisable rhythmic patterns, no discernible metre (regular or irregular) and also, because of the absence of a regular pulse, no sense of speed. The lack of perceptible coherence is due in large part to the absence of operational laws of pragnanz , but more importantly, it is proposed, to the fact that the relationship between pitch and rhythm, in integral serialism, was artificial: divorced from the naturally occurring pitch-rhythm continuum. Cowell drew such close parallels between the frequency ratios of the harmonic series and their corresponding rhythmic counterparts and the structures of harmony, that he developed a whole new musical ‘language’ which went so far as to classify rhythmic relationships as consonant or dissonant: those which were easily resolved as subdivisions (or subdivisions of subdivisions) of a basic unit being classed as consonant, while those which were not, being classed as dissonant. To appreciate this last point fully, we need to consider periodicity. We know that each partial is a whole number multiple of the fundamental. This means that during the ‘period’ of one cycle of the fundamental, each partial will undergo a number of periods in whole number ratio to the frequency of the fundamental. Since the frequency ratio of the first and second partials is a very simple ratio; 1:2 (in terms of pitch, the octave; in terms of timbre, harmonic), the beginnings of their periods will coincide every other cycle of the second partial. In the case of ratios to be found much higher in the harmonic series, for example 15:16 (which, in terms of pitch, corresponds to the interval of a minor 2nd and in terms of timbre to an inharmonic colour), then the beginnings of periods will only coincide after 16 cycles of the higher have passed: the more cycles that pass before all the periods coincide, the less stable or more dissonant the relationship. It need hardly be pointed out that this applies as much to pitch and timbre (where the terms would, up to now, have been harmonic and inharmonic rather than consonant and dissonant) as to rhythm. In Cowell’s terminology, the rhythm derived from a timbre with four partials referred to above would be consonant, whereas the additive example derived from the ratio 7:8, would be dissonant. Whilst Cowell’s ideas about rhythm had great artistic potential and a firm foundation in musical acoustics, difficulties arose along with the realisation that many of the rhythmic relationships he wanted to exploit were, in fact, unplayable with any degree of accuracy. Cowell ‘solved’ this problem by collaborating with Theremin  in the development of a new, mechanical, instrument called the rhythmicon. The rhythmicon could realise the desired relationships accurately, but it was unwieldy and restricted in terms of timbre. A different, it could be said, more convincing, solution was proposed by the American composer Conlan Nancarrow (1912-1997) who, taking Cowell’s ideas as a starting point, turned to the player piano: punching the piano roll in spatial ratios corresponding to the desired temporal ratios, allowed previously unplayable rhythms and tempo relationships to be executed with accuracy, and at speeds well beyond those achievable by human performers. However, whilst Nancarrow’s works for player piano are truly groundbreaking in their treatment of musical time (click here to listen to Canon X), there are still limitations in terms of the lack of unity of the musical elements of melody, harmony, rhythm and timbre. Thus the solutions to the organisational problems of rhythm caused new, insurmountable ones in terms of practicality and of aesthetics. 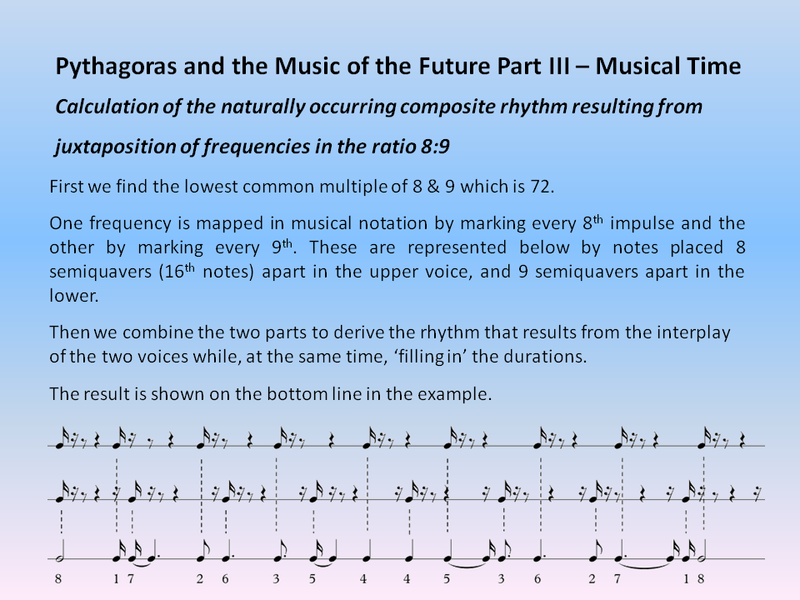 However, Cowell’s particular contribution in the domain of rhythm is seminal in that it highlighted the physical relationships that exist between the frequency ratios of the harmonic series and the microstructures that constitute timbre and harmony as well as the macrostructures that govern melodic intervals and all aspects of musical time i.e. rhythm, metre and tempo. In the previous article, we noted the correspondences that naturally exist between harmonic timbres and consonant intervals on the one hand and between inharmonic timbres and dissonant intervals on the other. The foregoing discussion of Cowell’s theories with regard to rhythm leads us to similar observations: frequency relationships to be found in the higher reaches of the harmonic series, such as 15:16, 20:21 etc would give rise to inharmonic timbres, dissonant intervals and rhythms which would be perceived as additive and in their entirety, non-retrogradeable. Those of the lower frequencies would give rise to harmonic timbres, consonant intervals and rhythms perceived as divisive. Since concepts of consonance and dissonance depend, to a certain extent on their context, it is proposed that a more appropriate term for these ‘polarities’ – between which there is a continuum – would be harmonic and inharmonic, irrespective of whether they are describing relationships in the domains of melody, harmony, musical time or timbre. This clears the way for a kind of musical thinking, also seeking to establish unity of pitch, rhythm and timbre, which can be brought to full realisation only by the deployment of digital computers and dedicated software, and which will be discussed in the next article Pythagoras and the Music of the Future Part IV – Synthesis. The term ‘percussive harmony’ was coined to denote chords, often polytonal in nature, which are acoustically so complex that it is difficult to ascribe definite pitch to them – as would be the case with unpitched percussion instruments. French composers Francis Poulenc, Arthur Honegger, Darius Milhaud, Georges Auric, Louise Dury, Germaine Tailleferre. Where different parts (voices) of the music have different time signatures or the effect of such e.g. 3/4 in one voice and 2/4 in another. This is not to be confused with hemiola (q.v). Whilst such ratios were suggested by Romantic composers, particularly in music for piano, their notation was often inaccurate (as in the Chopin example above) and the notational context often militated against their accurate interpretation. See Hook, ‘How to Play Impossible Rhythms’. In his treatise, The Technique of my Musical Language, Messiaen refers to the interval of the augmented 4th being perceivable by a ‘fine ear’ when a low C is played on the piano. This is clearly a reference to the audible 10th harmonic of the note C which, he proposes, can function in the harmony as an ‘added note’ and which will have a tendency to fall towards the principal note. He also draws a parallel between added notes in harmony and added values in rhythm e.g. the addition of a dot (lengthening the duration by half) to the penultimate chord of a cadence. This suggests, at the least, an awareness of a certain acoustical correlation between harmonic and rhythmic functions. A term from Gestalt psychology which states that the constituent parts a structure (for example a melody or rhythmic pattern) must exhibit similarity, continuity, proximity and closure in order to be perceived as a whole. Further discussion of gestalt psychology as applied to perception of melody is to be found in my article Let’s Make Music (forget reading it for now)! Leon Theremin, Russian inventor (1896-1993). His most famous invention was of one of the earliest electronic musical instruments, the Theremin.